Close to M1 & M25 motorway links. 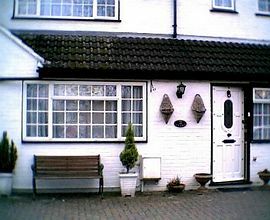 The Hawthorns is a warm and comfortable B&B with a friendly host and hostess. It is situated in the road next to the main business park in Hemel Hempstead. There are two good pub/restaurants within a five minute walk and a corner shop that sells just about everything. There is a leisure centre fifteen minutes walk away (Jarman Park) that comprises six cinema complex, an ice skating rink, ten pin bowling, swimming pool, running track, pool tables and many games machines, two night clubs and several fast food outlets. The Hawthorns provides free Wi-Fi broadband (secure), 200 channel digital TV and videos in all rooms and a free 450 film library. There are also tea and coffee making facilities and we provide a full English breakfast. Iron and ironing board and hairdryer are available for guests and there is ample off street parking. We have a public payphone and fax facility. We are one mile from M.1.junction 8 and 5 miles from M25 junction 21, and are quite near St Albans (roman ruins) and only a 25 minute drive from London. £25 per person per night for multiple occupancy rooms(twin,triple,double). £35 per night for single en-suite or double or twin room for single occupancy. £30 per person per night for double en-suite. Rooms are available from midday unless by prior agreement. Rooms must be vacated by 10am on day of departure. Smoking Facilities: Smoking is not allowed. Smoking area on patio outside house, in back garden. Special Diets Provision: Special diets are catered for. By special arrangement. M1 exit 8. Go over two roundabouts then take the first on the right into Leverstock Green road. Adeyfield free church is first building on left in the road. We are next to it (no 48).